An attraction with a difference! That’s how one would describe the unique place in Bagan which is called Bulethi. This place is just more than a temple site. Bulethi offers some incredible view of sunset. Moreover, you can also witness some out of the world experience. The site has hot air balloons and you can hop onto one and enjoy some breathtaking views around Bulethi. If you’re scared of heights then you can watch those balloons go up in the air and please your eyes. Some great photographs will make your trip memorable. People normally club together Dahmmayan Gyi Phaya and Sulamani Guphaya Temple while planning their visit to Bulethi. Must see. I would give it 6 stars if I could. I've been to many Buddhist temples from Cambodia, Java, Thailand and Vietnam but this is by far the most ornate. Start from the North to see the original statue from when the temple was built. Note the Indian features on the Buddha and the face changes from different distances. Then go around and see the Buddha face change with Burmese (squarish) and later Chinese (sharpish, small eyes) features. Our guide, Ya Ye Ye was phenomenal for the nominal fees we paid. The place is amazing really,but from this year you can't go up to see the sunset,so try somewhere else,and there is just a lot of people trying to sell you paintings,they kill the mood a bit. 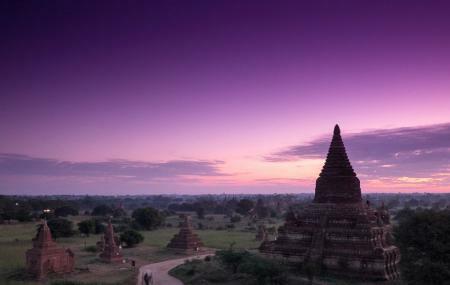 Bulethi Pagoda is a very popular place to view the famous sunset drenching the many temples, stupas, and pagodas in a myriad of sunset colors in Bagan Myanmar. Some would say an ethereal experience. Our guide got us there an hour before sunset to access the best viewing perspective, which was ample time, however it fulls up fast and with people and their cameras and tripods who take their mission quite seriously. To access the best viewing spot, you have to climb a precariously steep, narrow step 3-tier set of brick laid stairs...NO HANDRAIL; hence potentially dangerous. Our guide said that someone slipped, fell and died 1 week prior; not sure if that was true or an attempt to heighten our awareness. But if you're in decent shape and are careful, the experience is worth it. Advisable to take a hat, sun block, and sun glasses protection while waiting for the sun to set. Before we climbed up the pagoda, we had an avocado smoothie from a vendor at the base of Bulethi Pagoda. It's entirely surrounded by a grid, maybe to prevent people to climb and to damage. Its forbidden to climb any longer.